"Fossil fuel use is causing runaway global climate change, threatening people, cities and ecosystems with a dangerous future of flooding, extreme heat, fires and superstorms. But we still have time to reverse course if the world can transition to renewable sources for almost all energy purposes within the next few decades. The sooner we do this, the sooner we will improve public health, build resilience and foster a clean-energy economy — and the less we will have to pay toward the high cost of climate adaptation." SPUR's extensive and achievable three big ideas - by way of nine strategies - give us hope in addressing the climate call to action, and provides readers with a detailed course for which to contribute to the call. 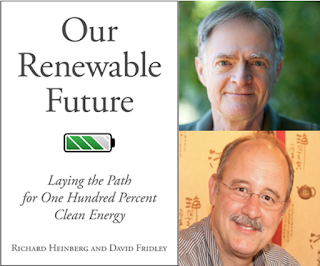 Further, if you followed TransportiCA's September Book Club selection - Our Renewable Future, the path to 100% renewable energy is mostly before us, with some innovation and the desire to change for the better needed beyond today. 1. How many Bay Area cities, and representing what percentage of the Bay Area's population, have adopted Climate Action Plans? 55 cities, 80% (page 5). 2. True of False: Natural gas burning in commercial and residential applications emits more greenhouse gases in the Bay Area than the region’s five large oil refineries combined — not even accounting for leaks in the system. True (page 10). 3. The quickest and least expensive way for the Bay Area to advance a fossil-free energy system is through __________. Efficiency (page 16). To send-in your responses, submit via TransportiCA's "Contact Form" on the front-page (bottom left), sending your name, email address and answers. The deadline for submission is 23:59, Saturday, 31 December 2016. From all correctly answered submissions, one name will be drawn as the winner of Our Renewable Future. All employees of TransportiCA, Island Press, SPUR, as well as, the Post-Carbon Institute (staff and Fellows) are prohibited from entry. Thank you for your interest in a fossil-free future, and we wish you the best of luck with the contest! Fossil fuel use is causing runaway global climate change, threatening people, cities and ecosystems with a dangerous future of flooding, extreme heat, fires and superstorms. But we still have time to reverse course if the world can transition to renewable sources for almost all energy purposes within the next few decades. The sooner we do this, the sooner we will improve public health, build resilience and foster a clean-energy economy — and the less we will have to pay toward the high cost of climate adaptation. California has the most ambitious climate policy framework in the world, and the San Francisco Bay Area has the resources, political temperament and innovative spirit to demonstrate how to work toward eliminating fossil fuel use. This means ending our dependence on petroleum and natural gas and powering our buildings and transportation system with renewables like solar and wind. We can prototype ways to become fossil-free, modeling them for cities and urban regions around the world, and we can take important, relevant climate actions that confer benefits at the local level. If we succeed, this model can be exported throughout California and beyond. 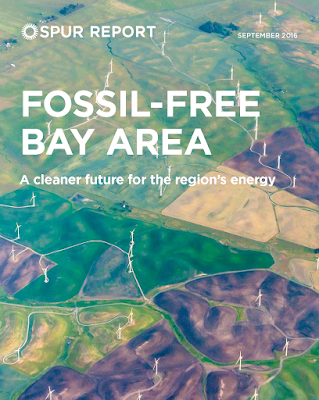 In this report, SPUR addresses the question: What can the Bay Area do to end our fossil fuel dependency? Our goal is to create a policy agenda to accelerate the transition toward a high efficiency energy system and away from carbon-based fuels, to create a model for other urban regions to do so and to become more climate resilient in the process. 1. Consume less fossil fuel by eliminating unnecessary energy waste and improving energy efficiency of buildings, land use and the transportation system. 2. Electrify most energy uses, to convert buildings and vehicles that currently burn natural gas or gasoline to instead use the electricity grid, which will increasingly provide renewable energy, thanks to continuously advancing policy. 3. Generate renewable electricity to replace fossil fuel uses and meet almost all energy needs with 100 percent renewable sources like wind and solar. Our recommendations provide the necessary background and a framework for local government, in partnership with regional agencies and state and federal governments, to influence some of the millions of private-sector and personal decisions that get made around energy every day, in support of a fossil-free future. This framework recognizes that energy technologies are constantly evolving and that public policy should aim to speed adoption without making implementation exorbitantly expensive. It also implores us to recognize that cities and regions have unique control over how people travel and commute compared to other levels of government, and that the transportation system’s use of fossil fuels, particularly for passenger cars and trucks, is far greater than any other single source of emissions in the Bay Area and across the state. These three big ideas — reduce, electrify, decarbonize — will allow the Bay Area to significantly reduce fossil fuel use, reduce our contributions to global climate change and improve our climate resilience. They will help us enjoy cleaner air, better economic opportunity and more transportation choices — and give us the opportunity to demonstrate a model of true urban sustainability that can be applied around the world.